Seeing Sterling K. Brown shirtless is a gift. Thankfully for us, Ellen DeGeneres gave us that gift when the This Is Us star stopped by her show earlier this week. The Emmy award-winner is the latest hunk to strip down on The Ellen DeGeneres Show, and we’re not complaining. 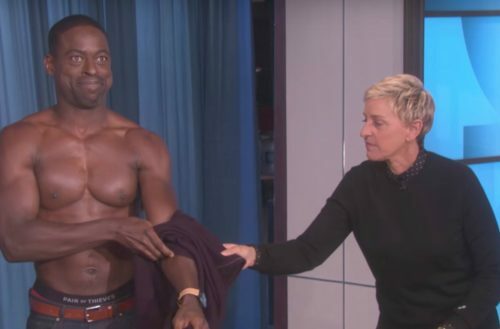 This isn’t the first time Ellen has gotten one of the stars from NBC’s hit family drama to take off his shirt. Our favorite heartthrob Milo Ventimiglia went into a dunk tank — for a good cause, of course. You may recognize Ventimiglia from Gilmore Girls, Heroes or from the new television sensation This Is Us that makes us weep every week. One of the many reasons the series is our newest guilty pleasure is Ventimiglia himself. The 39-year-old stud has major heartthrob status, so much so that he was featured in People’s “Sexiest Man Alive” issue. But back to Sterling K. Brown, Ventimiglia’s costar who just won an Emmy for his role on the show. Brown stopped by Ellen’s show alongside Ventimiglia and Mandy Moore, another one of their costars. Since Moore and Ventimiglia both had memorable moments from their previous visits to Ellen’s show, the out comedian decided to combine the two appearances and do something special for Brown. She asked Brown to take off his shirt and ride a tractor — something Moore had done when she was on the show a few months ago. Ventimiglia also reminded them all that Justin Hartley, another castmate, also took his shirt off when he appeared on the show. So those are three reasons you need to start watching This Is Us. The end result is pretty silly, but also hot — because we get to gawk and stare at Brown’s swole body.